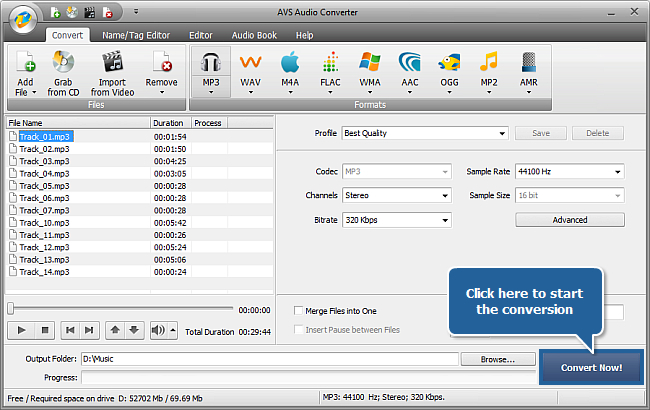 How to convert between audio formats? We have a great variety of multimedia players. The list of existing audio formats is also quite long and it is obvious that your devices are not designed to support them all: say, some of them are supported by your stationary DVD and some – by your portable device. How to play your recorded audio encoded in a format supported by your portable device using a DVD player and vice versa? 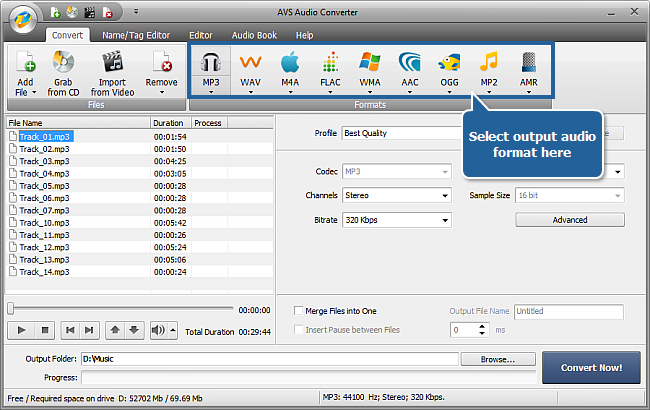 AVS Audio Converter will come in handy to convert between different audio formats – so giving the exact answer to the question above. Follow the steps below and you will see how simple and efficient it is. Select one of the 3 available options to load audio into the program. 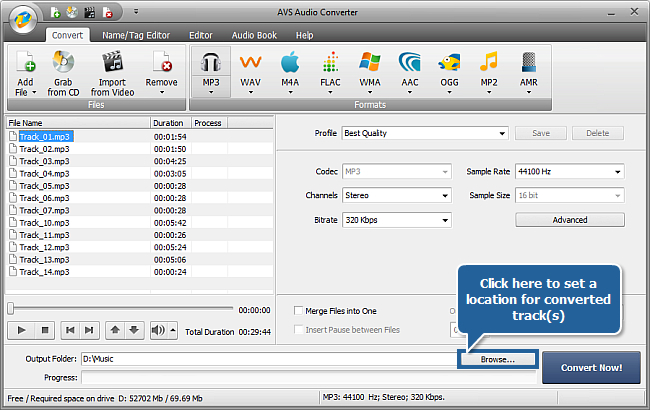 Press Import from Video to import the audio track(s) of a video file into the program. Select one of the default conversion profiles in the drop-down list of the Profile field. Profile is a pre-made parameter configuration designed to serve a particular purpose (for example, to create a file of a certain quality or a file for playback on a particular device). We recommend using default profiles if you are new to audio conversion. Note: some parameters cannot be changed depending on the format selected. Visit Profile Editor Pages of the online help to learn more on how to adjust output format settings. 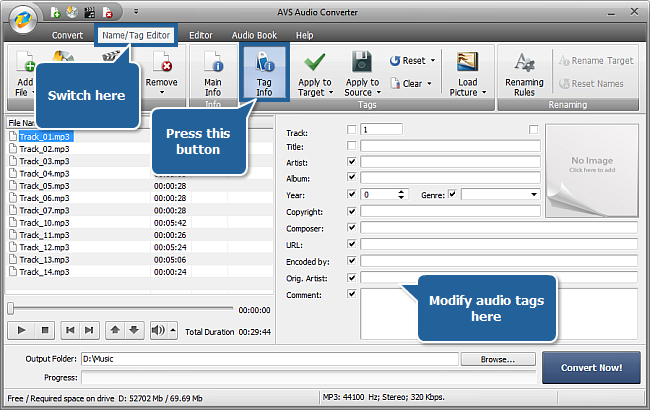 Tags are built-in text information about an audio file such as track name and number, its author and release date etc. It might be useful to fill out the tag fields because many audio players use tags rather than file names when playing back audio files. Fill in the tag fields (all fields are optional). 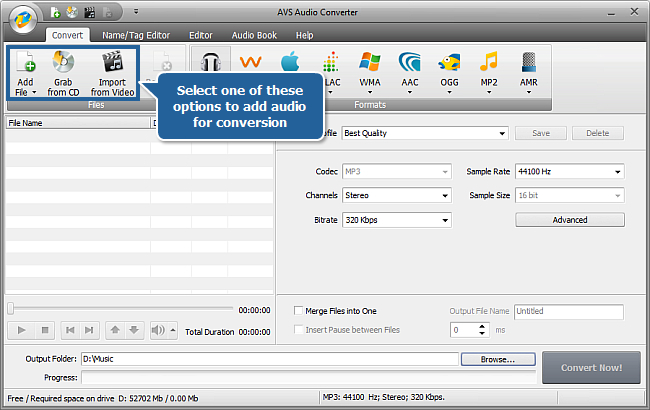 Press Apply to Target to save tags to some audio files selected in the conversion list. Press the arrow under the Apply to Target button and select Apply to All Target Files to save the information you entered in the checked audio tag fields to all audio files loaded into the program. Both these options save audio tags to the converted files. Press Apply to Source to save audio tags to original audio file. If you want to save the modified information in the checked tag fields to all original files, press the arrow next to the Apply to Source button and select the Apply to All Source Files option. 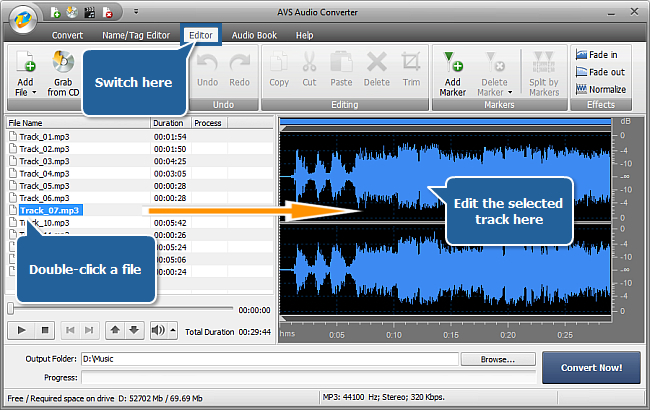 Refer to the Modifying Tags chapter of the online help to learn more on how to edit audio tags. 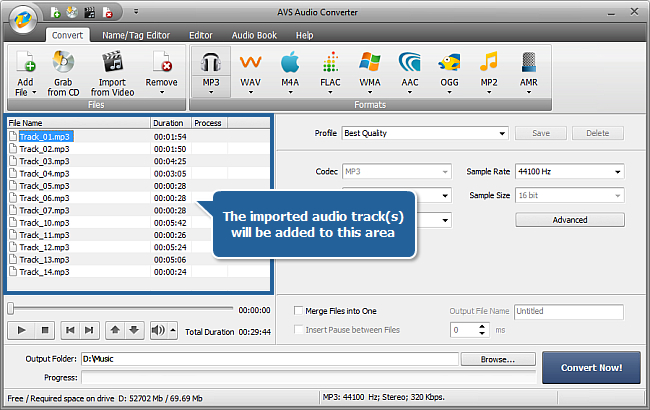 Visit the Editing Audio chapter of the online help to learn more on how to edit audio tracks in AVS Audio Converter. Finally, click the Convert Now! button and wait till the process is completed. The duration will depend on the number of files you convert, output format settings and your computer capabilities. Some time later you will be able to check the converted files in the assigned output folder and transfer them to any supported device.